Today in Renfrewshire there was a lovely mist after the rain went away. There was a layered “shades of mistiness” effect that I couldn’t resist. I haven’t felt like stopping by roadsides recently due to lots of large and upsetting changes in my life, but I’m glad that the desire to do so here was too strong too resist. 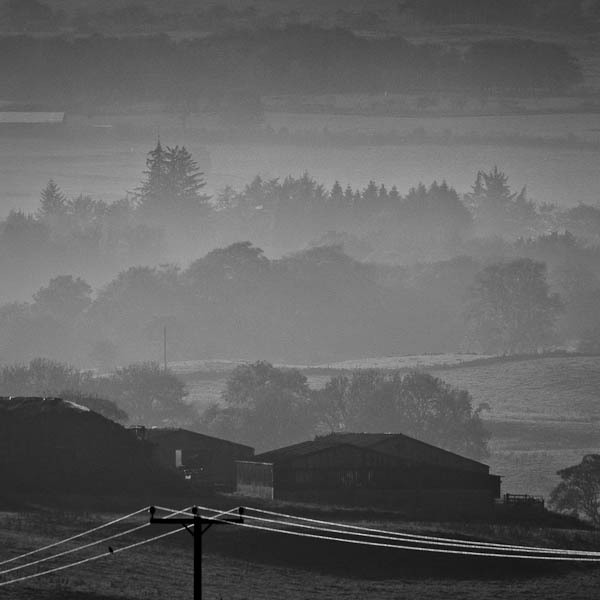 This picture was very much snatched, and required a square crop to make the foreground wires work as a subject, but still captures something of the frequently misty landscape around Bridge of Weir in Renfrewshire. I’m really sorry to hear that things are not good for you atm, Matthew. Hope you get some rays of sunshine despite the rain. Take care. This is lovely Matthew, it reminds me of the view coming in to Huntly Aberdeenshire on some mornings, but imagine it all in an inky blue watercolour effect to get what it looked like…magical. I wished I’d been a photographer then and I too would have stopped the car and grabbed a shot.